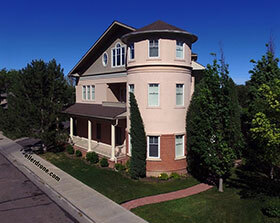 Located in sunny Pueblo, Colorado, the Aberdeen Surgicenter offers guests a truly unique setting of privacy, comfort and convenience. Inspired by the timeless beauty of Southern architecture, the building itself feels more like a stately home than a state-of-the-art Surgicenter. Guests can also enjoy views of the adjacent Pueblo City Park greens. Inside, the feel of a private home continues with comfortable lounges, quite consultation rooms and discrete treatment suites. The Surgicenter was intricately designed to accommodate every phase of a procedure, from initial consultation to follow-up visits. In fact, Dr Marin performs the majority of his procedures here. The Surgicenter is AAA and Medicare certified, and all anesthesia is administered by a board certified anesthesiologist. Due to special circumstances, some individuals may not be able to come to the Surgicenter for treatment. To insure his availability to these patients, Dr. Marin also maintains surgical rights at several area hospitals. Please call our office for more information.